Now there are all types of reciprocating saws on the market today, from corded to cordless, to professional versions which will take a beating and keep coming back for more. In this review of the top 5 best reciprocating saws and buying guide we will take a look at some of the most popular saws on the market today. All come from brands you know and trust, but when it comes to finding the right reciprocating saw, the devil is in the details. As such, let’s take a closer look at five of the most popular reciprocating saws on the market today and what I consider to be the most important attributes to consider when considering to add one of these workhorses to your toolkit. 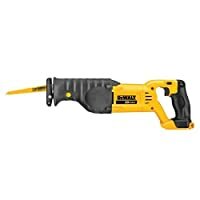 This is one of the companies you think of when it comes to professional-grade tools and this 18-volt cordless reciprocating saw, lives up to the company’s reputation. Another feature are the electric breaks which help to prevent wear. This is important when you are looking at any power tool as the gears on less expensive models can wear out easily. Once you pick this baby up you will know why is the one of the top 5 best reciprocating saws on the market. On the downside, the batteries are not included, and this is a bit frustrating. I mean, why don’t the manufacturers include the battery? That being said, the DeWalt Bare-Tool DC385B 18-Volt Cordless Reciprocating Saw comes with one-year free service and a three-year limited warranty. So you know DeWalt stands by their products. This is corded reciprocating saw comes with a 10-Amp motor. Now there are times when having a cord is better. You don’t have to worry about keeping your battery charged or having a spare battery. Furthermore, corded power tools tend to be more powerful. However, this reciprocating saw is not meant for remote worksites, unless you have a generator handy. 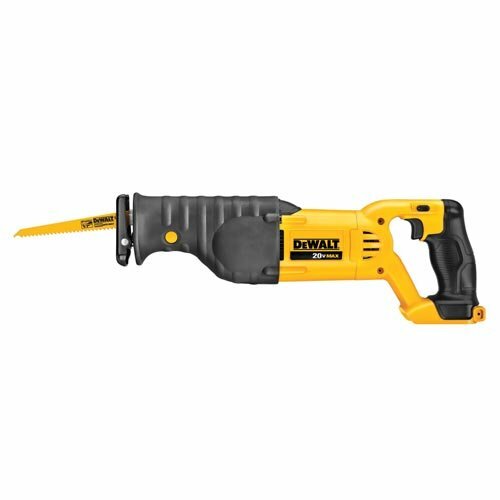 Like many of DeWalt’s reciprocating saws, the DWE304 comes with a 4-position blade clamp and this allows you to make the right cut the first time. This reciprocating saw puts 20-Volts of power in your hands. It is strong, and fast – top speed of 3,000 SPM. However, the battery IS NOT included. Sorry DeWalt, but this really steams me. 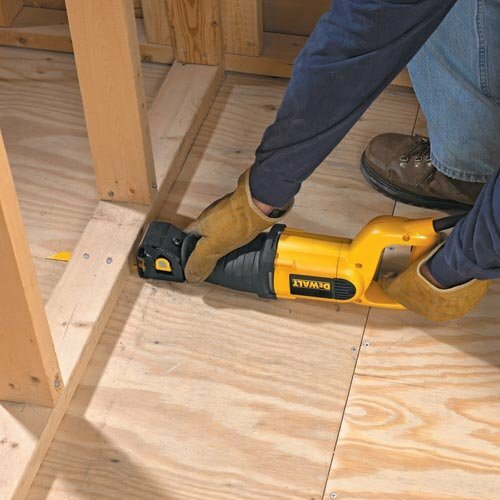 Another feature of this saw is the adjustable shoe which allows you control your cut. So if you are looking for a powerful, fast, yet precise reciprocating saw, this might be the choice for you. If you are looking for power, then look no further as this reciprocating saw puts 11-Amps of cutting power in your hands. This reciprocating Saw has one of the best power-to-weight ratios on the market today so is it easy to see why it is one of the top 5 best reciprocating saws you can buy. As you can tell by the title, this is a cordless reciprocating saw with a 20-Volt motor. Though this is at max power, so you don’t want to use it there all the time or you will burn out the gears…. Black + Decker has long been the choice of the do-it-yourself crowd for their inexpensive, yet well-made tools and the BDCR20B 20V MAX Lithium Reciprocating Saw is a surprising entry to their product line. Surprising because it is so powerful that even a pro might consider adding this reciprocating saw for their tool box. This saw is also fast with 3,000 SPM and a stroke length of just under one inch. 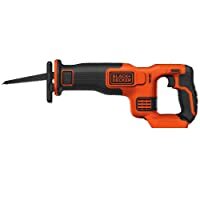 However, this cordless saw comes without the battery, so make sure you get the right battery and charger if you pick up this reciprocating saw. I am not really a big fan of the cordless reciprocating saws. Largely because I am rarely in a remote situation so for me, I am looking for a powerful saw which can take a beating and come back smiling for more. As such, the reciprocating saw in my workshop is the Bosch RS7 1-1/8-Inch 11 Amp Reciprocating Saw and why not, this is the saw the pros use. The reciprocating saw is the blunt instrument of the cutting world. Granted you can use it for exact cuts, but there are probably better choices in your toolkit. You want a reciprocating saw when you need brute force to knock down whatever is on your way. As such you need a powerful motor – one which can get you through almost any material known to man. You also want to look at other things like blade length, ease of changeover (this is when you change out the blade), cordless or not cordless, and warranty to name a few. Reciprocating saws are the tool of choice for all sorts of construction jobs including HVAC, plumbing, demolition, and electrical work. As such let’s take a closer look at what I believe are the most important features when deciding which reciprocating saw to buy. Saw no more. If you want a saw that can hack its way through anything it better pack a punch. Anything less than 18-Volts for a cordless model or 10-Amps for a corded model is just a child’s toy. You can even buy reciprocating saws with up to 15-Amps of power, but I would say these are for more specialized applications such as full-time demolition work or cutting metals. Even most general contractors don’t carry a saw that powerful. No matter what you chose make sure it is the right fit for the job and my best recommendation would be to buy a model with 20% more power than what you will need on a day-to-day basis. This way you won’t burn out the motor. This is an ongoing battle when it comes to power tools. 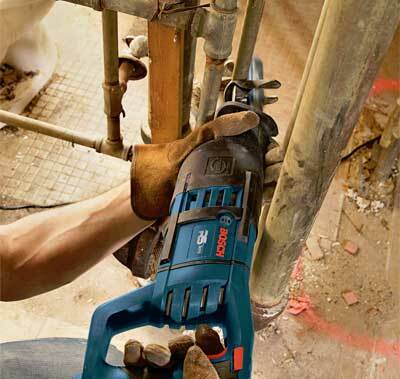 Granted cordless power tools are more flexible and are great when you are working on remote jobs sites without power or a generator. However, battery life can be an issue and most cordless power tools are not as powerful as their corded cousins. That being said some cordless reciprocating saws will offer slightly longer blade lengths – up 1 ¼ inches or more. In the end, it all depends on how and where you will use the reciprocating saw. My recommendation would be go with a corded reciprocating saw, especially if you are working around the house. These will last longer, offer more power, and you will not have to worry about keeping the battery charged. Size does matter, especially when it comes to reciprocating saws. If your stroke length is longer, then you can get through the job quicker. Most reciprocating saws will have a blade length from ¾ inch to 1 ¼ inch. For my money, you want one in the 7/8’s range. This will provide the ideal stroke allowing you to get through just about anything. 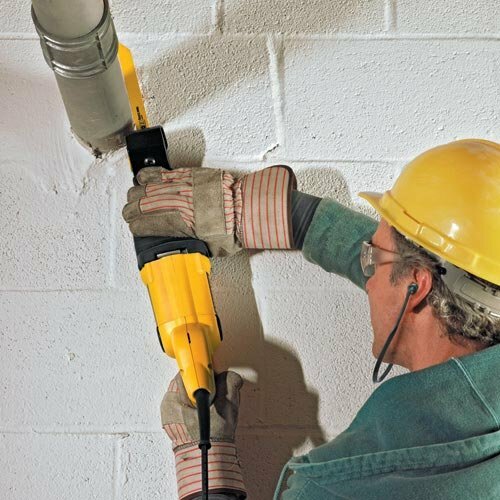 You are not going to use a reciprocating saw to get through a 3” thick concrete wall, that is what a sledge hammer or pneumatic hammer is for. Getting back to your reciprocating saw, the ability to adjust the blade length and this can be a real positive. So look for this when deciding which one is the best for you. Whether you are a professional or a weekend warrior, you want a reciprocating saw which will last. However, the one downside to all reciprocating saws is that they will all eventually make their way to the great tool shed in the sky. This is just the very nature of having a saw that can cut through anything the gears will wear out over time. That being said, you don’t want it to happen after using it for a month. As such, you should look at the manufacturer’s warranty. Three years is the ideal coverage, though longer is always better. You want to get to work, not fumble with a key or even worse try to remember where you kept it. Even though I have 5S’d my workshop, I keep forgetting to put the darn things back in their place. As such, you want, you need, a reciprocating saw which does not require a key for blade changes. Quick, easy, yet secure is the way to go. Just make sure your blade is properly secured as you do not want it flying off at 3,000 SPM. Even if you are a professional, you are only going to invest in what makes sense for the work you do every day. This means tool heads beware. Granted reciprocating saws are extremely versatile, but why spend hundreds of dollars on a tool you will never use. In the end, you need to choice the reciprocating saw which is right for what you are going to do and how often you are going to use it. This might mean the $50 saw if you use it once a year or the deluxe version for several hundred dollars if your livelihood depends on it. Ok, there are so many things to look for when buying a reciprocating saw that I could go on for days. These include blade movement (orbital or straight, though I think this is a matter of personal preference), speed, rotating handles (especially useful for tight fits), vibration and weight. Whilst the last two are more comfort features that anything the others will impact how you do your work. So the biggest key when buying a reciprocating saw, or any other power tool for that matter, is knowing how you will use it. As you conduct your due diligence, make sure to check customer reviews on Amazon and other websites. Talk to local contractors, find out which reciprocating saws they use and why. All five of the saws reviewed here are highly rated and have great reputations, but the key is to look for other customers who will use the cart in the same way you will. Remember to check out the terms. Is shipping included and what is the warranty? We live in the real world, so make sure you check the fine print first. Lastly, make sure your reciprocating saw of choice is in stock. If not, they find out when it will come in, or if you need it for an urgent job then you will need to go to Plan B. All five of these reciprocating saws are best on the market, but for different reasons. In the end, the choice is yours. Are looking for power? Then go for a corded model. Are you looking for convenience? Then you will need a battery powered model – just remember the batteries are usually sold separately. 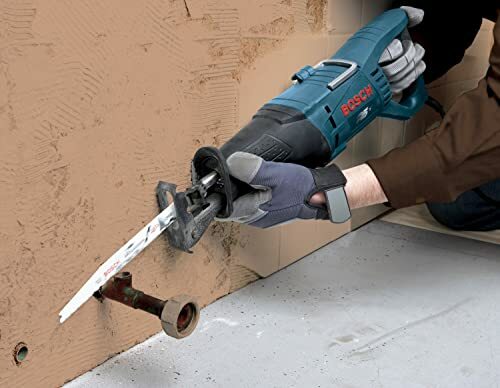 As mentioned, my choice is the Bosch RS7 1-1/8-Inch 11 Amp Reciprocating Saw as it is workhorse and can handle everything I need it for around the house. For your part, look at the job you need your reciprocating saw for and then make the choice based on the best fit. Now that’s said, get out there are cut cutting.